Are you interested in what your park group has in common with larger park conservancies and alliances? Park groups of any size need to balance programming, fundraising, relationship building, communications, and group structure. Come to this workshop to learn how leaders developed successful park organizations. Once you register, you can submit your question to our expert speakers and help shape the panel discussion, so register today! Bram Gunther is the senior advisor and co-founder of the Natural Areas Conservancy, a champion of NYC’s 20,000 acres of forests and wetlands. He also serves as co-director of the Urban Field Station, a unique collaboration between NYC Parks, U.S. Forest Service, and the Natural Areas Conservancy to promote research and communication on urban ecology and conservation. Bram joined NYC Parks in 1991 as an Urban Park Ranger, eventually serving as the program’s director and then chief of Forestry, Horticulture, and Natural Resources. He co-founded the Natural Areas Conservancy in 2012 and holds a master’s degree in environmental management from the Yale School of Forestry and Environmental Studies. Mac Levine is the founding executive director of Concrete Safaris, an organization that prepares East Harlem youth to lead healthy lives and shape their environment through outdoor education, play, exploration, and community engagement. In 2008, Mac brainstormed with 16 children about how they wanted to improve their health and that of their community. Each child said they wanted to live in a cleaner, greener, safer neighborhood. They decided to start their efforts with a community garden. Since then Concrete Safaris has supported over 10,000 youth ages 7-24 in this work. Concrete Safaris is the only organization positioned within NYCHA developments specifically to teach outdoor pursuits like gardening, cycling, hiking, and shutting down streets for outdoor play. Julian Macrone is the associate director of Fort Greene Park Conservancy; a group that has stewarded, fundraised, and advocated for Fort Greene Park since 1998. Julian first came to Fort Greene Park as an NYC Parks intern for park director David Barker in the winter of 2015, and was subsequently hired as FGPC’s first full-time staff person after the group had functioned as an all-volunteer organization for seventeen years. Together with FGPC’s Board of Directors, the park director, and the surrounding community; Julian has overseen all aspects of programmatic and organizational growth. He is a graduate of Middlebury College with degrees in philosophy and environmental policy. Christina Taylor is the executive director of Friends of Van Cortlandt Park (FVCP), a group founded in 1992 to bring youth, community, and nature together. She started as FVCP’s education coordinator in 2000, directing environmental education and additional programs for local high school students. In March 2007, Christina was appointed as the executive director of FVCP; where she now works directly with the board of directors to monitor the organization’s budget and implement programming and fundraising efforts. 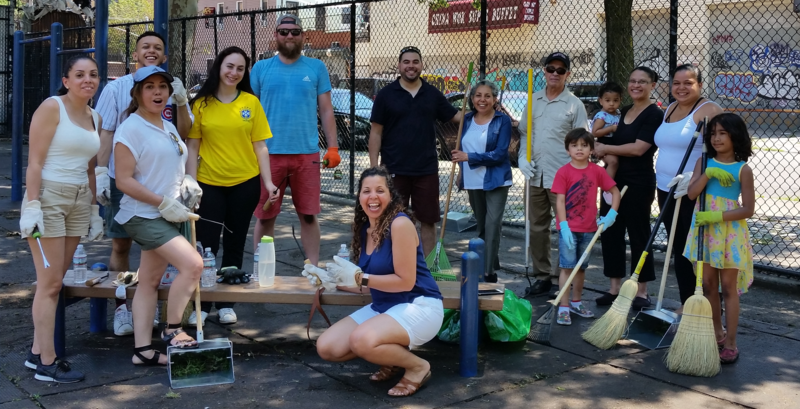 Under her leadership, FVCP has grown to become Van Cortlandt Park’s primary educational and stewardship organization; serving 6,000 people a year through their programs, while raising vital funding for the Park.